Aqua Lani J305 is located on Maui island ranked #1 Best Luxury Destination in the USA and #2 Best Beaches in the USA by U.S News & World Report published April 19 2018! Maui island was also voted #2 Best Island in the U.S by Cond&eacute; Nast Traveler's Readers' Choice Awards published on October 17 2017 And for the seventh year in a row in 2018 Maui earned the coveted top spot as the #1 Hawaiian Island from Travel and Leisure's esteemed readers! Private Paradise Villas personally manages 21 exceptional villas within this award-winning location offering a curated and exclusive collection of 2.5 to 4 bedroom villas most with panoramic ocean views Private Paradise Villas is in part responsible for the recent attention and accolades generously gifted to Wailea Beach Villas by the traveling public Private Paradise Villas has provided a group of discerning property owners and all guests with exceptional first-class standards of Personal Concierge Service villa housekeeping and property care since 2006 utilizing a staff comprised of 40+ seasoned dependable employees with nearly a dozen managers who were trained at bona-fide 5-star ultra-lux world-class hotels and resorts. Private Paradise Villas is now a Premier Partner with HomeAway a designation awarded solely based on performance HomeAway evaluates response time accept rate review quality and more to determine eligibility and conducts assessments every quarter Look for our Premier Partner badge on all of our property listings on HomeAway! Wailea Beach Villas is a beachfront resort on Wailea Beach and Maui Island's leeward shore with 2 heated pools & hot tubs fitness center low-density villa residences and direct access to Wailea Beach and the Shops At Wailea Choose from premiere 3 bedroom accommodations in the prestigious beachfront or ocean view A C or D Buildings or from a special selection of panoramic ocean view 3-4 bedroom residences on the highest 4th and 5th (top) floors or affordable 2.5 bedroom options that are surrounded by lush tropical foliage and blooming flowers. J305 Aqua Lani at Wailea Beach Villas was the featured property in a story about upscale villas managed by Private Paradise Villas on Maui in the October 24 2010 issue of the San Francisco Sunday Examiner. Aqua Lani J305 is a stunning new upscale Wailea Beach Villa J305 was recently enhanced with the addition of a three-piece Natuzzi-brand Italian white leather sofa set to the great room along with additional sofas and lounging/seating added to the bedrooms We also just added a beautiful New Zealand wool area rug in the great room. J305 is always maintained to a very high standard with first-class fresh clean cheerful light color interior including the introduction of fresh live green plants for healthy living and a barrista quality espresso machine! J305 was fabulous before but now it is truly ultra-luxurious and first-class quality. This fresh and vibrant vacation accommodation should be called "The Art Gallery Villa" since it is home to many very fine quality original art pieces that are distinctive and fun Experience this spacious three bedroom villa with top-of-the-world panoramic ocean views and exceptional above-average luxury interior appointments. Reserve this villa J305 Aqua Lani and receive all of the following newly expanded and enhanced benefits (and more) now! The name Aqua Lani can be translated as "Heavenly Blue" This well-styled contemporary villa is truly a heavenly home-away-from-home This sublime villa serves as the perfect backdrop for a collection of carefully chosen original art Included in the "mini-gallery" are oil and watercolor paintings accent pieces and hand-made sculptures - all of which reflect the brilliant and invigorating colors of the natural environment found on Maui The 2,300 square feet of simply stunning luxurious living space is perfect for entertaining or nesting All of the furnishings and decor are new as of late 2008 Aqua Lani is the ideal abode in which to retreat relax and renew your spirit This elegant upscale villa features a west-facing view of the Pacific Ocean impressive golden sunsets and distant whale watching (in season with the cooperation of mother nature) The spacious great room an abundance of natural sunlight refreshing tropical breezes and breathtaking ocean view all serve to make Aqua Lani one of the finest concepts of luxury living Sparkling and radiant Aqua Lani will soon be the preferred vacation villa for those seeking contemporary luxury in the heart of Wailea. Sleep in true bliss atop plush ultra-premium beds A choice of three king beds or two king beds and two extra-long twin beds is provided One of the king beds was designed by Vera Wang and the other beds are some of the very best quality offered by Serta Embellished with high-thread count all cotton linens down pillows and tropical weight down duvets every bed offers a heavenly sleeping experience that can be favorably compared to any of the finest hotels in the world. The master bedroom offers a serene personal space from which to gaze at the amazing ocean view Step out from the master bedroom directly onto the ocean view outdoor terrace Large picture windows capture a priceless view of the Pacific An over-sized bathroom adjoins the master and it features an oversized soaking tub with folding shutter windows that open to the bedroom From the soaking tub you have a view towards the blue ocean and the wall-mounted 42" flat-panel 1080p high-definition television A writing desk is equipped and set up as a convenient spot to make calls send a fax scan a document or work on your portable computer The villa provides both wired and wireless high speed internet access along with unlimited domestic long distance phone service Both communication services are fully complimentary - no charge to our guests. Multiple entertainment options allow for guests to enjoy their own choice of relaxation in privacy Each bedroom is enhanced with a 42" flat panel 1080p high definition television HD digital cable service with HBO and ShowTime an iPod dock and CD/DVD player The great room also has NetFlix and is equipped with a 50" 1080p high definition flat panel television with digital cable service HBO ShowTime CD/DVD player digital video recorder (DVR) and an iPod dock. Aqua Lani is situated in convenient proximity to The Shops At Wailea. The Beach Villas are set in the heart of an acclaimed world-class resort. Guests should expect a slight mix of ambient living sounds. The building is well constructed with double pane glass windows which provide excellent sound insulation. We find Aqua Lani to be remarkably quiet, peaceful, tranquil and overall vastly superior to staying in any nearby hotel/resort. The overall experience is that of a serene peaceful environment. Adjacent resort hotels in Wailea occasionally produce open-air entertainments or events such as luaus or corporate parties, which may include fireworks or musical performances which may be visible and/or audible within Wailea Beach Villas. Supervision of children when using outdoor balcony/veranda "lanai" areas is required. We are the original villa rental agency that pairs extraordinary vacation residences with complimentary "Personal Concierge Service". We are proud to be named the "Villa Rental Specialist for Hawaii" by Conde Nast Traveler Magazine in the 2012 to 2007 issues. We are the direct rental source for an extraordinary collection of select and ultra-luxurious villas on the island of Maui, Hawaii. The vacation residences featured in the Private Paradise Villas boutique collection serve as "Your Own Private Paradise" where you can relax and refresh in true luxury and true togetherness with every comfort and convenience provided. Select one of our exclusively managed and sumptuously prepared resort villas or homes, and experience an effortless vacation where you can "Delight In Every Moment". Private Paradise Villas is the exclusive rental agent and property manager for a custom curated collection of homes and villas throughout Maui, Hawaii. Private Paradise Villas (previously named Tropical Villa Vacations), a dedicated in-house property management agency, is the direct rental source for an exceptional and extraordinary collection of select and sumptuous ultra-luxurious beach front vacation estates, elegant villas, secluded retreats, and romantic hideaways on the island of Maui, Hawaii. Private Paradise Villas is the exclusive rental agent and property manager for a custom curated collection of homes and villas throughout Maui. Add value and pleasure to your precious holiday with an abundance of personal pampering enhancements. After you've booked your property, your Personal Concierge is available for all of your family's Travel Needs, Private In-Villa Chef Service, Private Yoga, Massage, and other Wellness and Fitness Fun, Art, Cultural and Sightseeing Explorations, Private Boat/Sailing/Scuba or Snorkel Charters, Helicopter or Hiking Charters, Golf and Dining Reservations, Personalized itinerary. Perfect stay - perfect weather - ate too much - the perfect vacation. A big Mahalo nui loa to our wonderful guests for taking the time to write the prefect review for their perfect vacation!! It does not get any better than the beach front Wailea Beach Villas. Stunning upscale, state of the art villas, fully equipped & stocked for your every desire, you add the groceries. Pools, hot tubs, fitness center, walk to Wailea shops, personal concierge services, and so much more. We look forward to welcoming you ( our family & friends) back to Maui no kai oi! Until then, A hui hou from all of us at Private Paradise villas! 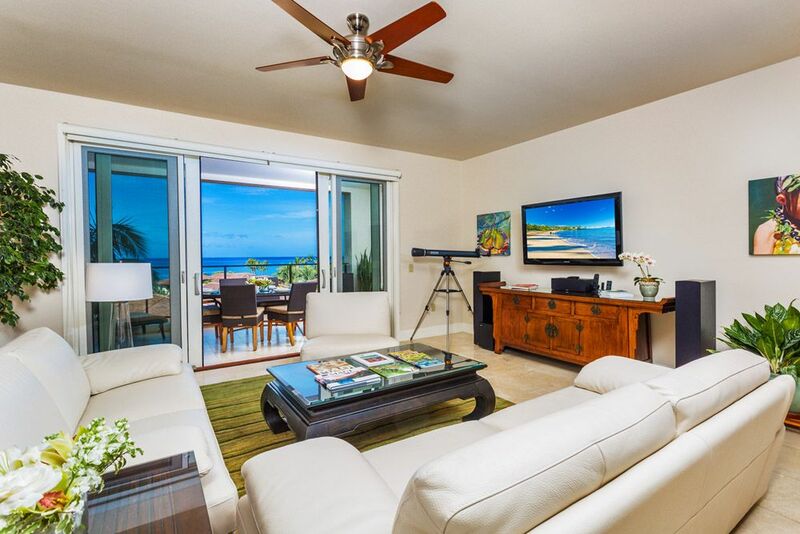 We are discerning travelers and this Penthouse villa (Aqua Lani) was as luxurious as advertised. It's in a great location in Wailea and the Wailea Beach Villas complex - VERY short walking distance to the Shops at Wailea, the gym, pool, and lobby. The villa itself was so well appointed and stocked that we tried to find things they might not have - a chip bag clip, a rice cooker, salad spinner - but we laughed because they were all there! I HIGHLY recommend this villa to any family seeking high end comfort, service, convenience, and the best way to enhance your stay on Maui! The Villa is beautiful and well appointed. Everything we needed or wanted was supplied. Magnificent view and well kept grounds. Quick and easy access to beach, shopping, restaurants. Staff are very friendly. Perfect vacation for our family. We appreciate your fabulous review of Aqua Lani, a stunning 3 bedroom 3 bath villa with spectacular ocean views and upscale amenities. We’re so happy that everything you needed or wanted was supplied! We look forward to welcoming you back as our guest. Everything about this property was pure delight!! Details abound! Just perfect! Every part of this vacation rental was amazing...the location, the property/pools/beach, the view from our lanai, the details in decorating, and fully equipped kitchen. Only wish we had more than our one week stay! Just amazing! Thank you for your wonderful review of Aqua Lani! We’re so happy to hear that you thought every part of your vacation rental was amazing. Your family was fabulous to host and we hope to welcome you as our guest again soon! Experience this private sanctuary of secluded and generously sized villa residences with upscale hotel services and amenities at owner direct rates. You are guaranteed the specific residence, decor, location, and view as represented on this individual property display. There is a difference in quality when renting a "Wailea Beach Villa" offered by Private Paradise Villas. Wailea sandy swimming beach is easily reached by meandering just a short distance past cascading waterfalls, emerald green gardens, and orange, yellow, pink and red blooming hibiscus and plumerias. Never before have any private accommodations of this quality been offered before, with such convenient access to Wailea Beach. From the adult pool, gaze down the crescent shaped golden sands of Wailea Beach, while your surroundings are punctuated by visually stunning impressions of deep blue water, crimson and scarlet sunsets, and powder blue skies dotted with white cotton-candy clouds. The Wailea Beach Villas were designed as a world-class residential resort comprised of 98 elegant private residences set on 11 acres nestled between the Shops At Wailea, Wailea Beach and the Pacific Ocean. The Wailea Beach Villas, a sublime eden within Wailea, are graced with a symphony of glowing tiki torches, the golden sands of Wailea Beach, big blue skies, glorious sunsets, and immediate access to the azure blue Pacific. This gated vacation paradise with its polite and attentive 24 hour security personnel, is embellished with verdant manicured gardens, blooming colorful tropical flowers, cascading waterfalls, two swimming pools one designated for adults and the other for families, two outdoor whirlpool hot tub spas, an elaborate fitness center with locker rooms and showers, Activity Room, Fully Accessorized Business Center, Beach Services, and Pool Attendants. Here only a limited number of fortunate visitors will have the opportunity to restore and renew themselves within a residential community fashioned as a luxury resort.